Game of Thrones: Two Swords – TV review | What Hi-Fi? Welcome back Game of Thrones. You've been missed. If you've been following Game of Thrones from the start, watching a new episode is like slipping on a pair of comfortable slippers. By now you're familiar with the flow; its tendency to flit from character to character and location to location at a moment's notice. Stories that seemingly have no connective tissue are part of a larger canvas, even if it's not apparent in the way they are linked. There's a confidence to Game of Thrones and it's especially evident in the opening salvo of the fourth season. Two Swords picks up from the aftermath of the infamous Red Wedding, with Charles Dance's Lord Tywin Lannister forging two new swords (hence the episode's title) from the Greatsword of the late Eddard Stark (played by Sean Bean in season one). The smile that trickles onto Tywin's face, along with the subtle soundtrack playing the Rains of Castamere, suggests that the Lannisters have finally beaten their foes and the melting of the Stark Greatsword is symbolic of that. Unfortunately, the past has a habit of being dug up, and this game of thrones is about to stutter back into life. Two Swords lays the groundwork for the main conflicts and tussles that will drive the forth season. The show now has a huge cast of characters (to make it trickier, a few more are added) and Two Swords does well in providing a general overview of what’s happening while dropping clues as to what's in store. The biggest introduction concerns the presence of the Martell family as Prince Oberyn (Pedro Pascal) and his paramour Ellaria Sand (Indira Vama) reach King's Landing in time for King Joffrey’s (Jack Gleeson) wedding. It's apparent from the off that there's bad blood between House Martell and House Lannister, and Oberyn’s outward hostility to those who bear the Lannister name (stabbing one Lannister in the hand) is a strong indication that, while the Lannisters may have vanquished their foes, there are others ready to step into the fray. The problems for the Lannisters get worse with Jaime's return (Nikolaj Coster Waldau) not heralded all too well by Cersei (Lena Headley), who believes he took too long in coming back (harsh, but that's Cersei all over), while Jaime – clean cut with short hair – struggles to adapt to life after being held captive and losing his hand. Tyrion (Peter Dinklage) has problems of his own, with Cersei spying on him and Shae (Sibel Kekilli) becoming disillusioned with her role in their relationship. Tyrion's attempts to console Sansa fall on deaf ears (he's having zero luck with the ladies). As they would really. After all her family was slaughtered, effectively by his dad. On the other side of the world we catch up with Daenerys (Emilia Clarke) and her pet dragons, which have grown considerably. Thanks to some decent CG and special effects, the dragons look great and are wonderfully integrated into each scene (we especially like the gust of wind when the dragons take off). 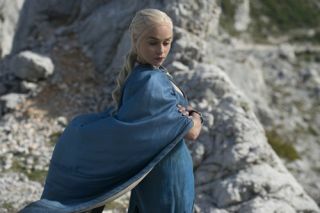 She’s heading to Meereen, having freed the cities of Astapor and Yunkai. While there’s not much to the story, it at least conveys a more confident and determined Khaleesi than we’ve seen before. It’s a decent introduction that gives Dany the purpose that other seasons found tricky to convey from the start. And Two Swords reminds us of what’s happening up North with Jon Snow, now healed and fit for duty, but dragged in front of a tribunal to explain his actions with the wildings. Suffice to say there are some in the Knight’s Watch who’d rather see Jon Snow without a head. The Wildings across the Wall are not forgotten as they meet up with the Thenn tribe (replete with facial scars and a taste for human flesh) as the battle for Castle Black is slowly set up for what is set to be one of the highlights of the season. And last but not least is “Arya and the Hound’s travels across Westeros”. It’s perhaps the best moment of the episode as they come up against a group of the King’s men in an inn (one of them killed a friend of Arya’s (Maisie Williams) in season two) and Arya sets about taking her revenge. The chemistry between the Williams and Rory McCann (The Hound) is terrific, with some line readings genuinely funny, bringing a sense of humour to the proceedings. It’s a tense scene that eventually erupts into a barroom brawl (but with swords). Arya gets her revenge (and her sword Needle back) but at what cost? The last shot sees them heading towards some desolate and ruined lands that leaves the question of what's in store for them? It's a question that applies to all the characters we've seen so far. Despite the sense of normalcy that this episode starts off with, things are more uncertain than ever. And for some, it's about to get much, much worse.